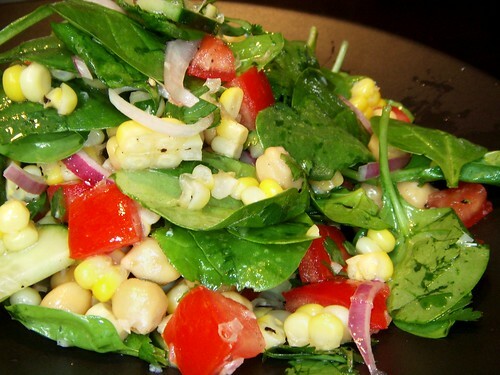 corn and baby spinach salad with muddled garlic cilantro and lime dressing, originally uploaded by aarn! +10th November, 2008+. made a dressing by muddling 1/2T. of crushed garlic, and a handful of chopped fresh cilantro leaves in the juice of a lime. mixed in 1T. of canola oil, making kind of a vinaigrette, then added a splash of white vinegar, salt, and pepper. boiled a few ears of sweet corn until the kernels were tender, then sliced kernels from the cob. put the dressing over baby spinach, diced tomato, cucumber, thin sliced red onion, and garbanzo beans.